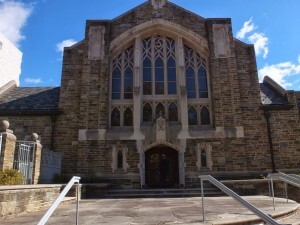 Roya’s baptism was held at Western Presbyterian Church on November 3rd. Western has a special place in my heart. I first set foot on the church grounds when I volunteered at Miriam’s Kitchen in 1994. Western is also the place where I met my dear friend and Roya’s godmother, Amy, across a crowded pew. Love how Roya is sucking her thumb here! 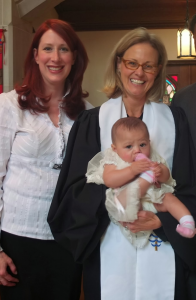 During the baptism, Roya clearly enjoyed being the center of attention. She didn’t make a peep during her part of the service, and even leaned her head back on her own as the baptism commenced. 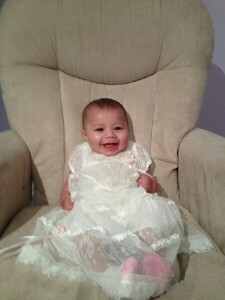 Not surprisingly, I teared up as the minister baptized Roya, thinking about what a miracle she is! Once our portion of the service was over, the church apparently became too quiet for Roya’s liking. She thus decided that she needed to interject her own babbling commentary during the sermon. Once the service was over, we headed to Ris for a delicious brunch. I found Roya’s baptismal gown at Neiman Marcus. The dress had an antique feel (or enough of one that we were asked if it was a family heirloom) without being too long or frilly. Roya rolled around and napped in the dress after the service, and the material still looked fresh. At the end of a long, wonderful day! We’re thankful for Western’s warmth in welcoming our daughter and sharing such a memorable day with our loved ones!